About a month ago, a man in our ward had to move unexpectedly, and he was unable to take his nine chickens with him. He gave them to us. Lucky us. After getting a coop and some fencing, we were ready for our new adventure. It has been fun. And easy. Truly. The kids love hunting for eggs, and I love just watching them. 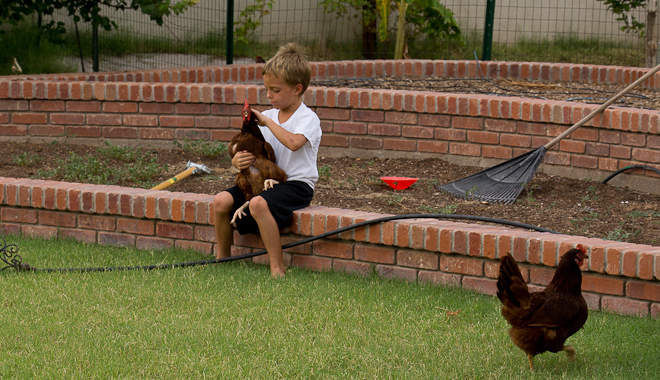 Hyrum is our resident chicken whisperer. He loves these chickens. He pets them and chases them. One in particular is his favorite. Her name is Elizabeth. She will come up to you clucking whenever she sees you, and she arches her wings like she wants you to pick her up and pet her. Elizabeth is Hyrum's pet chicken. Last night, as we were getting the chickens back in the pen for the night, I commented about how dumb chickens are. Hyrum was quick to defend his pets. "They're not dumb, Mom. They just have small brains. It's not their fault that Heavenly Father made them small brains." 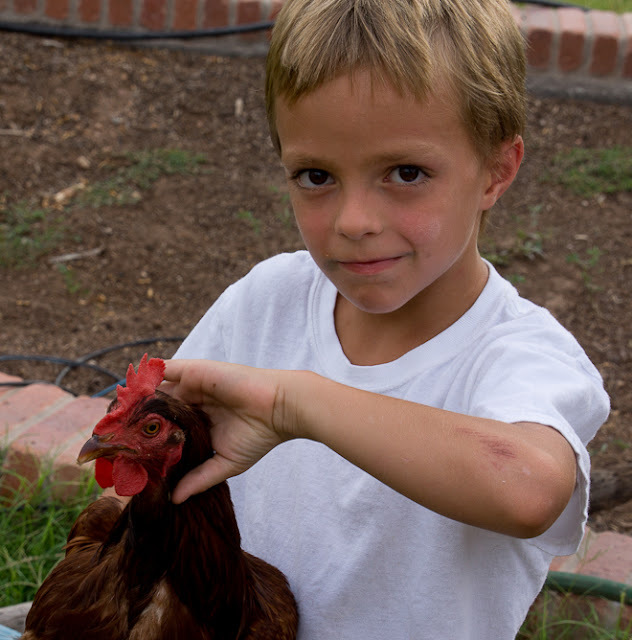 Don't be dissing the chickens in front of the chicken whisperer. See..chickens ARE fun. 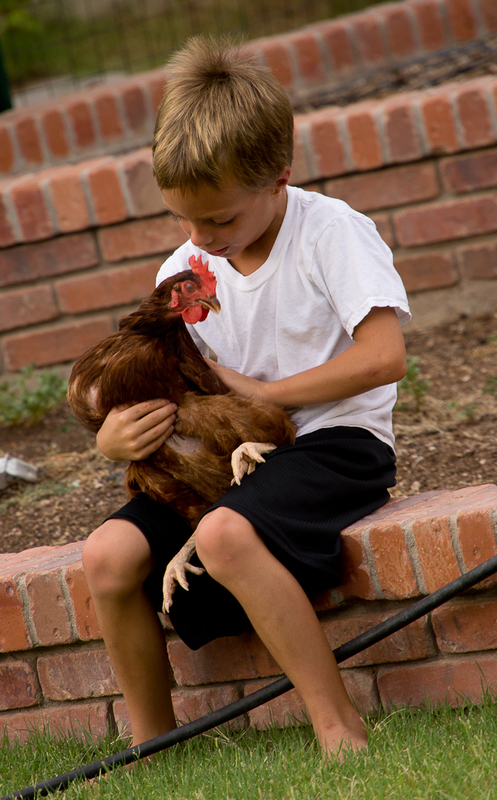 We love our chickens, too. And always having fresh eggs isn't bad, either. And in Arizona you don't even have to worry about trying to keep them alive during the freezing winter. Shade and lots of water in the summer is important, but if you let them roam, they will find shade. Enjoy your chicken adventure! What fun. 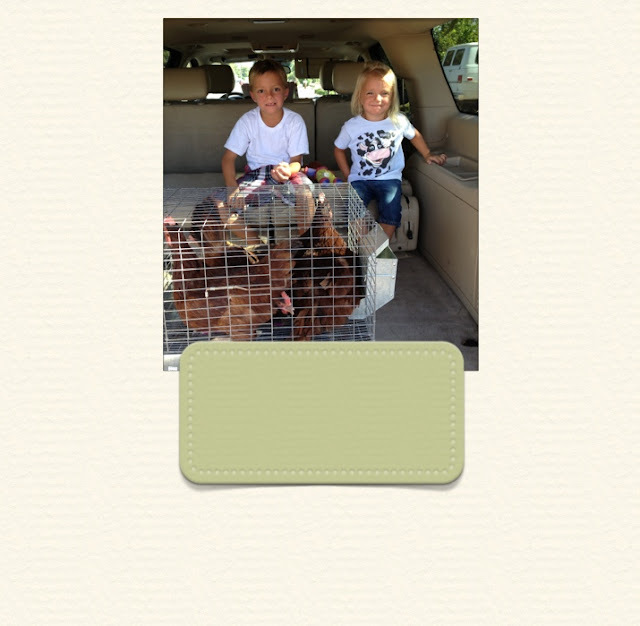 We enjoyed having chickens for many years. They are great pets as they will eat all food scraps, weeds and many bugs...and leave you an egg in return. chickens help with scorpions and other insects too! That is so totally awesome!!!!! Hyrum is my new hero. Anyone that defends the chicken is a friend of mine. They look like Rhode Island Reds. What a delightful read. He is too cute.